Cambridge, MA Violin Lessons Near Me | Fun Classes. Top Tutors. Check out some of our most popular teachers near Cambridge, MA including Boston, Brookline, Somerville, Lexington and Arlington. A wooden stringed instrument in the violin family; it is the smallest and highest-pitched. The violin typically has four strings tuned in perfect fifths, and is most commonly played by drawing a bow across its strings, though it can also be played by plucking the strings with the fingers (pizzicato). Violins are important instruments in a wide variety of musical genres. They are most prominent in the Western classical tradition and in many varieties of folk music. They are also frequently used in genres of folk including country music and bluegrass music and in jazz. Electric violins are used in some forms of rock music; further, the violin has come to be played in many non-Western music cultures, including Indian music and Iranian music. The violin is sometimes informally called a fiddle, particularly in Irish traditional music and bluegrass, but this nickname is also used regardless of the type of music played on it. I got my bachelor degree in Renmin University of China, which is one of the best university in China. I had 24 students before I came to States, several of them won the first prize in different violin competition. Have you or your kids always wanted to learn to play the violin? I am an experienced violin teacher specialized in beginner and intermediate violin students of ALL ages. I believe that it is never too late to learn to play the violin, no matter your age! I teach classical violin through Suzuki method and also modern violin with a focus on rock, jazz and improvisation. We start from the very beginning with the theory and history behind the violin. We then get you familiar with the instrument, and rhythms and musical symbols. You then start to because more familiar with reading and learning notes. What’s unique about my teaching is that I’m young just like you and I know that learning a new instrument is not only fun but exciting. My prices are low because I want you to feel like you don't have to give up on playing because its expensive. I’m here to help so let’s get started! My name is Maggie, I recently earned my Master’s degree in string performance at Boston University. I have won many prizes as a soloist. I have performed in the world’s most celebrated concert venues, including Carnegie Hall, Wiener Musikverein, Boston Symphony Hall, and the Berlin Philharmonie. As an orchestra musician, I have been playing for 10 years. I have been working as a music teacher for 11 years. I have taught violin, viola and beginner piano lessons. I love developing students love for music. I greatly enjoy teaching music students and sharing my love for music with them. I am a Taiwanese student, and I am now study in Boston University, major in violin. I can not only speak both Chinese and English fluently, but also can teach music theory and piano in the same time. I am a patient teacher, and most of my students enjoy having lessons with me, and stay close with me. I've been teaching for more than 10 years, and playing for more than 20. While my strongest background is in classical music, with over 20 years experience and a competitive resume, I also have fairly extensive experience with jazz, bluegrass, folk tunes, and electric violin. I take my pride in my ability to structure repertoire and exercises according to each student's goals. I've taught both group and individual lessons in the past, and founded and designed a program back in NJ for under-served communities without arts programs to learn violin from the ground up, with 50+ participants. My general approach is to maintain certain necessary basic technical standards and introductory milestones, while individualizing the repertoire and goals based on each student's interests, and their strengths and weaknesses. About Me: I teach violin and viola. I recently returned for my Master's in Music at BU in viola. I received my undergraduate degree from Princeton, with a Certificate in Music Performance while studying both violin and viola at Manhattan School of Music Pre-college(based in NY). I've been playing for more than 20 years. My main love and focus is classical music, but I've also played jazz, bluegrass, folk, rock, Broadway, and electric violin. I have a long history of teaching violin and viola, starting with my youngest siblings as guinea pigs! I strive to make learning and practicing exciting and accessible, and will adjust lessons, goals, and repertoire to fit each student, both in terms of their interests and how they learn best. l needs children. I love teaching, and I love seeing my students advance from week to week. Please feel free to message me with any questions about designing a program to fit your goals, or with any questions about my teaching methods. I primarily use the Galamian method for violin students, and Karen Tuttle's methods for viola students, but modify and adapt as needed based on what fits each student best, and what they are learning. The average cost of 60-minute violin lessons in Cambridge is $74. While the exact cost will vary depending on the teacher, type of lesson, and your location, you should expect to spend anywhere between $70 and $79 per hour. 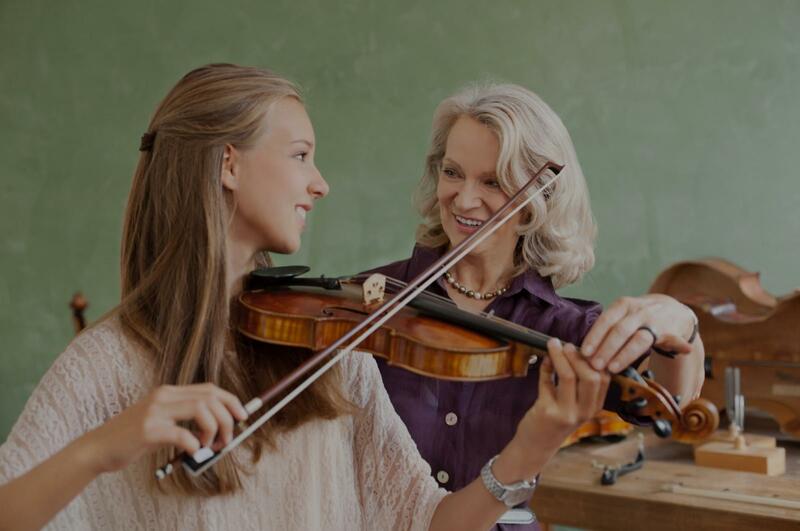 For the best experience, we typically recommend 60-minute violin lessons. However, students looking for a more affordable option may want to consider a shorter lesson length of 45 or 30 minutes. On average, 45-minute violin lessons are 28% less expensive at $54, and 30-minute lessons cost 34% less at $49. Curious how much violin lessons cost in your area? Do a quick search to get local prices for the best violin teachers near Cambridge. "Ali is a pleasant teacher and Allison has a great time with her for the first class." "I am an older adult learning violin for the first time and Jill is patient but persistent. In every lesson we move forward." "Ali is lovely and seems to have developed a good relationship with my young son." She has also spent the time helping some of our residents in improving their playing. She has a very quiet, wholesome personality, and reacts well with all!" ls to help me in the future. I know that she is going to make me a much better player." eful guidance. Jill is very good with children, and in each lesson she gently engaged her studentsâ attention on the music and on learning new techniques. The result was that both of our daughters were focused and made real progress every single week. We found that the Suzuki method of learning has worked very well for our daughters. Both of them (now aged 10 and 8) have gone on to play several in junior violin ensembles and take real pleasure and pride in their playing. They love music, and much of that is down to the wonderful early grounding they received from Jill." "A great deal of instruction in the first lesson."